REO began operating as a 501(c)(3) nonprofit corporation in May of 1981 as the Montana Farmworker Council and changed its name to Rural Employment Opportunities in 1984. REO has provided services to low-income and very low-income adults and children with funding from a variety of federal and state grants. Since 1981, a direct grant from the U.S. Department of Labor (currently, the National Farmworker Jobs Program) has allowed REO to serve migrant and seasonal farmworkers. Since 1988, grants from the Montana Office of Public Instruction – Migrant Education Program have enabled REO to add services for the children of migrant agricultural workers. 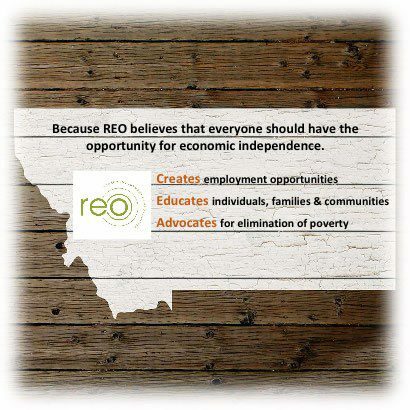 In 2008, REO became a full-member of Montana Shares, a partnership of more than 40 nonprofit organizations. Some private donations and grants allow for limited services to those not eligible for the federal grant-funded services.